The 2015 NFL Draft, which took place in Chicago, Illinois, last week, was a memorable experience for the 256 players that were selected. In total, the ACC had 20 players chosen in the draft, while the SEC had 22 and the Pac-12 had 25. There’s no doubt that the SEC is known as a college football powerhouse, but it’s become more evident that football on the West Coast is on the rise. The Oregon Ducks have represented the Pac-12 in great fashion over the last six years, and 2015 marked the third straight year in which five Oregon players were selected in the NFL Draft. No other school in the Pac-12 can make that claim. 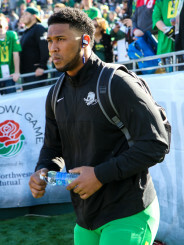 DeForest Buckner was paramount to Oregon’s success in 2014. Marcus Mariota, who was the 2014 Heisman winner, was selected second overall by the Tennessee Titans in last week’s draft. And although Oregon fans will miss Mariota, some experts believe that the Ducks will have another Top-5 draft prospect next season. According to Matt Miller of bleacherreport.com, DeForest Buckner may be one of the best defensive players in the country. Miller expects Buckner to be one of the most desired players in next year’s draft. It’s no secret that the Ducks’ defense took a hit after they lost to Ohio State in the national title game this past January. 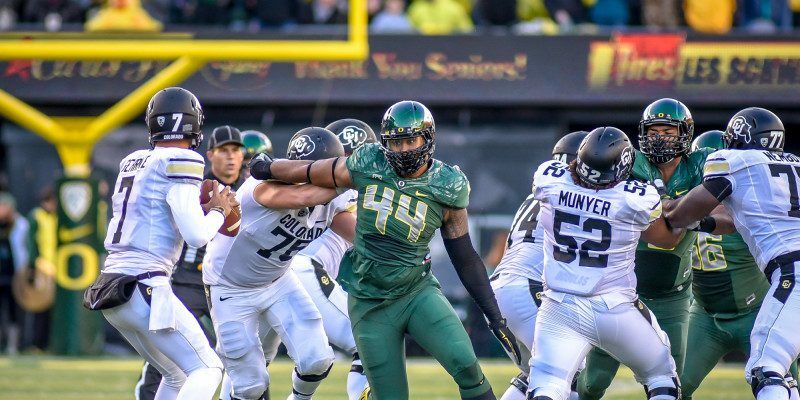 The departure of Armstead, Ifo Ekpre-Olomu, Erick Dargan, Troy Hill, Tony Washington and Derrick Malone created a gaping hole in Oregon’s defense. Buckner, who will be a senior this fall, is expected to lead the pack next year. 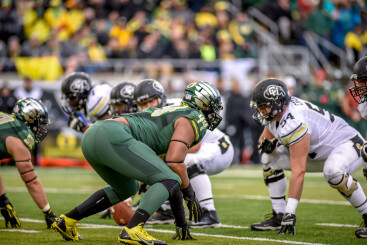 DeForest Buckner squares off against Colorado’s offensive line. The 290-pound defensive end had four sacks in 2014, and he also recorded 12.5 tackles for loss. Buckner’s athleticism and agility will allow him to produce great individual numbers, but his presence on the defensive side of the ball will be paramount to Oregon’s overall success, as well. Sports Illustrated‘s Chris Burke released his first 2016 NFL mock draft on Tuesday, and he believes that Buckner will be the fourth overall pick in next year’s draft. This year will be prove to be very interesting for the Ducks. And while the dynamics of the football scene continue to change, one thing seems very probable: Buckner should be proving his worth with a breakout season.